Guinness World Record "world's largest crocodile in captivity"
Lolong (died 10 February 2013) was the largest crocodile in captivity. He was a saltwater crocodile (Crocodylus porosus) measured at 6.17 m (20 ft 3 in), and weighed 1,075 kg (2,370 lb), making him one of the largest crocodiles ever measured from snout-to-tail. In November 2011, Australian crocodile expert Dr. Adam Britton of National Geographic sedated and measured Lolong in his enclosure and confirmed him as the world's largest crocodile ever caught and placed in captivity. Lolong died in captivity at around 8 pm on 10 February 2013 from pneumonia and cardiac arrest. Lolong was caught in a Bunawan creek in the province of Agusan del Sur in the Philippines on 3 September 2011. He was captured with the joint cooperation of the local government unit, residents, and crocodile hunters of Palawan. The giant crocodile was hunted over a period of three weeks; once it was found, it took around 100 people to bring him onto land. He became aggressive at several points during the capture, and twice broke restraining ropes before eventually being properly secured. He was estimated to be at least 50 years old. Lolong was suspected of eating a fisherman who went missing in the town of Bunawan, and also of consuming a 12-year-old girl whose head was discovered two years earlier. He was also the primary suspect in the disappearance of water buffaloes in the known area. In the examination of the stomach contents after his capture, no remnants of water buffaloes reported missing before Lolong's capture were found, nor human remains. The nongovernmental organization activist Animal Kingdom Foundation Inc., with the cooperation of People for the Ethical Treatment of Animals, had urged the local government of Bunawan to return Lolong to the creek of barangay Nueva Era, where the giant reptile was captured. But, in an ongoing debate, Bunawan mayor Edwin "Cox" Elorde and residents of the barangay opposed the crocodile's release, arguing that he would threaten individuals living in the vicinity of the creek. The crocodile was named after Ernesto "Lolong" Goloran Cañete as one of the veteran crocodile hunters from the Palawan Crocodile and Wildlife Reservation Center, who led the hunt. After weeks of stalking, the hunt for Lolong took its toll on Cañete's health. He died of a heart attack several days before the crocodile was captured. Bunawan made Lolong the centerpiece of an ecotourism park for species found in the marshlands near the township. Mayor Elorde said, "We will take care of this crocodile because this will boost our tourism and we know it can help in terms of town's income and jobs to our village communities." The giant crocodile was kept in an enclosure in the Bunawan Ecopark and Wildlife Reservation Center in Barangay Consuelo located 8 km from town. The exhibit was opened to the public on 17 September 2011, after permission was received from the Palawan Wildlife and Conservation Center. The Bunawan Municipal Council subsequently passed an ordinance regulating and imposing fees on gate entrance, parking, and other fees at the ecopark where the celebrity giant crocodile resided in captivity. Although the ecopark has a 20-peso entrance fee for adults and less for the children, these proceeds will be used for park maintenance and Lolong's food. The Bunawan Ecopark is also incurring expenses for electricity, maintenance, and other incidental expenses, such as installation of CCTV cameras. According to Bunawan Mayor Elorde, up to 26 October 2011, the celebrity crocodile had already earned nearly half million pesos in donations, entrance fees, and parking fees, with a daily income of about P10,000 that month. In June 2012, six months after Australian zoologist and crocodile expert Dr. Adam Britton gathered measurements, Lolong was officially certified by the Guinness Book of World Records as the "world's largest crocodile in captivity" at 6.17 m (20 ft 3 in). Experts from the National Geographic Channel found out that Lolong breaks the record of the previous record-holder: a 5.48 m (18 ft 0 in) male saltwater crocodile named Cassius kept in the crocodile park of MarineLand Melanesia in Queensland, Australia. The certification was read in public during Bunawan's annual local festival, Araw Ng Bunawan (Bunawan Day). Bunawan Media Affairs Coordinator Welinda Asis-Elorde said the local government unit, through a private-public partnership project, will be embarking on a P200-million site development project for the Bunawan Ecopark and Research Center. "You have more than 5,000 crocodiles, some of them are giants bigger even than Lolong at Agusan Marsh here in Bunawan, therefore we need a longer plan for more visitors to come and visit this homeland of the giants. We are embarking on this P200-million project now and for future generations", she said. Bunawan Municipal Planning & Development Officer Robert Floyd Salise, told PNA in an interview that the project will include the construction of cottages, lodging houses or inns, swimming pools, an amphitheatre, laboratory and research center, souvenir shops, pavilion, and other amenities. Lolong was found dead inside his compound at around 8 p.m. on 10 February 2013. The necropsy revealed he had died of pneumonia and cardiac arrest, which was aggravated by a fungal infection and stress. His remains were to be preserved by taxidermy. However, by July, it was reported that Lolong's remains were in deep freeze for five months at the Davao Crocodile Park, and that local government of Bunawan and the National Museum, jointly responsible, had not yet apparently agreed on a course of action. By June 2017, Lolong's remains were moved to the National Museum of Natural History in Manila which is set to open within the year. ^ ""Lolong" holds world record as largest croc in the world". Biodiversity Management Bureau. 17 November 2011. Retrieved 8 January 2016. ^ a b Britton, Adam (12 November 2011). "Accurate length measurement for Lolong". Croc Blog. Retrieved 8 January 2016. ^ a b "NatGeo team confirms Lolong the croc is world's longest". GMA News Online. 9 November 2011. Retrieved 23 June 2012. ^ "Lolong" holds world record as largest croc in the world Archived 19 April 2012 at the Wayback Machine. Pawb.gov.ph (17 November 2011). ^ Ortiz, Erik (10 February 2013). "Tears for a croc: Lolong, the world's largest crocodile in captivity, dies in the Philippines". New York Daily News. Retrieved 11 February 2013. ^ "Biggest Crocodile Ever Caught?". National Geographic. Reuters. 6 September 2011. Retrieved 23 June 2012. 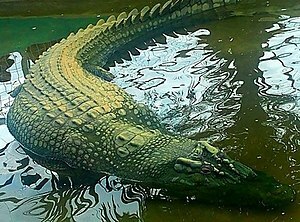 ^ "Giant crocodile captured alive in Philippines". Yahoo! News. Associated Press. 5 September 2011. Retrieved 23 June 2012. ^ "Largest crocodile captured: Lolong The Crocodile sets world record". World Records Academy. 12 September 2011. Retrieved 23 June 2012. ^ "Giant crocodile captured in Philippines – but a bigger one may be at large". The Guardian. Associated Press. 6 September 2011. Retrieved 23 June 2012. ^ Morella, Cecil (6 September 2011). "Philippines catches 'largest crocodile on record". ABS-CBNnews.com. Agence France-Presse. Retrieved 23 June 2012. ^ Anda, Redempto D. (10 September 2011). "'Lolong,' the crocodile hunter". Inquirer Southern Luzon. Inquirer News. Retrieved 23 June 2012. ^ "'Lolong' eco-park opens to public". ABS-CBNnews.com. 17 September 2011. Retrieved 23 June 2012. ^ a b "'Lolong's' Bunawan ecopark earns P500,000". Manila Bulletin. 27 October 2011. Retrieved 23 June 2012. ^ Britton, Adam (23 June 2012). "Lolong officially the world's largest crocodile in captivity". Croc Blog. Retrieved 26 June 2012. ^ "Largest crocodile in captivity". Guinness World Records. 23 June 2012. ^ "Giant Crocodile Breaks Size Record—Suspected in Fatal Attacks". National Geographic. 23 June 2012. ^ "'Lolong' is biggest captured croc – Guinness". ABS-CBNnews.com. 23 June 2012. Retrieved 23 June 2012. ^ "Pneumonia, stress contributed to Lolong's death, initial study shows". GMA News Online (20 February 2013). ^ "Lolong, once world's largest crocodile in captivity, now in National Museum". Coconuts Manila. 24 June 2017. Retrieved 25 June 2017. This page was last edited on 15 March 2019, at 01:37 (UTC).